I wanted to add voice control to RoboSapien. At first, I was thinking, just create an app on the phone, but that's been done before! Then I saw the Amazon IOT Challenge. How about make an IOT Robosapien. The next generation - Internet of Toys! Connect RoboSapien to the Internet. That would be Awesome, don't you think? 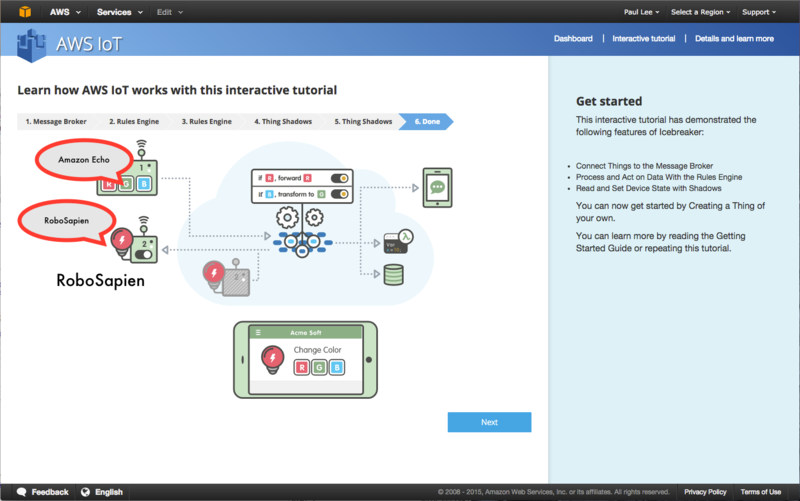 That's what I did; I started looking into the Amazon IOT service, try their sample apps. Very interesting indeed. I like the way they presented the diagram. Here's what I want to do.... Replace RGB controller with Amazon Echo, Replace the LightBulb with RoboSapien... Amazon Echo sends the command, RoboSapien follows. That's it. If you enjoy this project and want to see more, please add respect and follow me. Amazon Echo ... echo ... echo ..
Last year, I started looking at Amazon Echo. I got one because I attended a hackathon and worked on an Amazon Echo. It was my first introduction to the AWS Lambda, and I was hooked. I like the idea where I can focus on my code and not the infrastructure. So I downloaded the WAV files and started playing it on my phone connected with IR Dongle to audio jack. The RoboSapien is ALIVE! That brings me to an idea. What if I can connect it to a Raspberry Pi? Raspberry Pi has Audio jack, then I can attach it to the back of the RoboSapien. That's great news! No more heart bypass operation for the poor Robot. No soldering! it worked! Send update RGB colors from one window, the other receives the updates. Now I tried it on the Raspberry Pi with a Wifi connection. Then once the Command is received from Amazon IOT thru the "delta" event, play the correct WAV files. Playing WAV files on Raspberry Pi in NodeJS. I am new to NodeJS, I was able to update node on my raspberry pi with this link. I looked at some npm packages to play WAV files on raspberry pi, I am familiar with CylonJS. So I followed instructions on how to install CylonJS audio module. to convert all mp3, I used this command. I connected the RoboSapien dongle to Raspberry Pi audio jack. I played the mp3, and it worked! Woohoo! I actually did High Five RoboSapien. Echo Thingy. Connecting Amazon Echo to Amazon IOT. I couldn't find any sample code out there that connected Amazon Echo to Amazon IOT. Most of the examples are just connecting amazon Echo to a website. That's not going to work. I need to send MQTT messages to Amazon IOT. At first, I tried going thru their sample app. alexa-skills-kit-color-expert code and the thing-examples.js. At the end of the day, when I receive an intent, I need to connect to the thingymajigger. but the thingymajigger requires aws-iot-device-sdk library. How do I put things together? I found out you can upload a zip file of all the stuff you need. OK, I zipped up the js file together with node_modules and certs. Then run it. I got error left and right, up and down. It's complaining about certificates. I took it as a good sign because It's running index.js, that's a start. I was stumped, don't know what to do, it's complaining that it can't read the certificates. AWS Lambda can't read a text file, it's a permissions thing. A-ha, so I copied the contents of the file and shove it into a variable. At first, I wasn't including the BEGIN and END tags to the file, so I was getting frustrated. I looked at RoboSapien, he's dead. Battery's dead. I mean. Need to change batteries. Then I realized, I need to include the BEGIN Key and END Key. So I did all that to all the certs. I assigned the contents to a variable, instead of reading it from a file. That seemed to work. I used this test message to AWS Lambda. The most important thing is it connected to the thingymajigger. Cool! Then I looked at my device shadow, I got the value I expected! Next thing is to make the project in raspberry pi to receive messages from AWS IOT. I just reused the same template just to test if I'm going to receive data from Amazon Echo. I got the WALK command. I felt like walking in the clouds. Next stop, combining the thing-example.js code with cylon-audio js sample code. Here's my idea. When I receive a Delta event, play the corresponding mp3 command, then acknowledge the command by sending "NONE" command AWS IOT. I stored all the mp3 files to RoboSapien subfolder. Then, I created this audioFileName global variable. I detect if audioFileName is blank or not. If it has a filename then play that one. make it check every 500 ms.
Then when I receive a Delta command, that means somethingy changed, I get the command and assign the audioFileName variable. It listens to Amazon IOT for commands. I can actually update the Shadow, and it would send to all the listeners. Let's let him do the Nae Nae again! 1. The IR Sensor must be pointed to RoboSapien. Line of Sight is important. It is still a work in progress. It's a journey but it's all good. I enjoy trying to challenge myself how technology pieces can go together. Please add respect if you like these projects and follow me.